(KIA-POW-EVD) - On 29 April 1944 mission #144 to Berlin, Germany in B-17G #42-31241 Spirit of Wanette (427BS) GN-W. Received a direct flak hit in the #3 and #4 engine gas tanks which were punctured and leaking gasoline. The B-17 skidded out of formation, jettisoned its bombs, and feathered the #3 prop. The crew decided to head for neutral Sweden and saw no enemy fighter to Rostock over the Baltic Sea. A lone ME-109 appeared from German occupied Denmark and the B-17 was subjected to an intense flak barrage. The #2 and #4 engines were set on fire, the tail was hit and flight control cables severed. Lt Bohle (P) ordered his crew to bail out. S/Sgt Musashe (TG) was killed by the flak burst and crashed with the B-17 into the Baltic Sea. 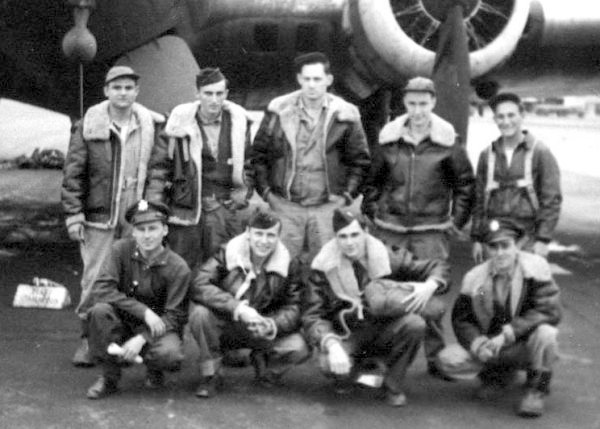 The crewmen in the rear of the B-17 landed in the Baltic Sea and drowned. Lt Kerr (CP) evaded capture, with the help of the Danish underground and returned to Molesworth on 30 May 1944. Other crewmen became POWs. Brock (TG) - Was not on the 29 Apr 44 mission. Substitute Tail Gunner was S/Sgt Musashe (KIA). S/Sgt Brock completed his 35 mission combat tour on 01 Aug 44.